Turn inexpensive Ikea framed mirrors into works of art by decoupaging them with fabric or paper. 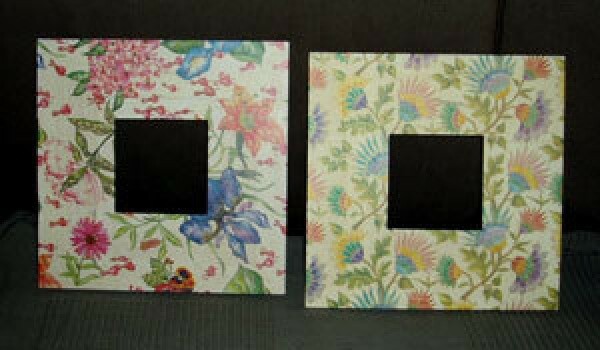 This is a guide about decoupaged Ikea mirrors. Buy the framed mirrors at IKEA and decorate. I usually use thin paper such as paper napkins, but recently I have started using thin, silk scarves for a somewhat unusual look. These are very easy and inexpensive to make and they are wonderful, homemade gifts for friends and family. 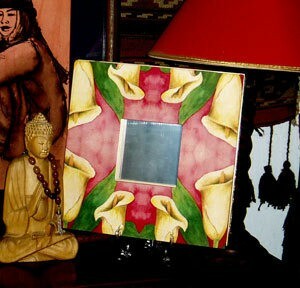 If you are using a mirror, remove the mirror from the frame. This doesn't necessarily have to be done, but I think the end product looks more finished off if the paper is glued into the inside of the frame. Practice positioning your paper in a pleasing way; if you are using stripes or other prints, it will look better if you position your design evenly. Next is to lightly glue the paper to the top side; this will make it easier for you to continue gluing without your paper moving around. I sometimes use a glue stick to do this step. 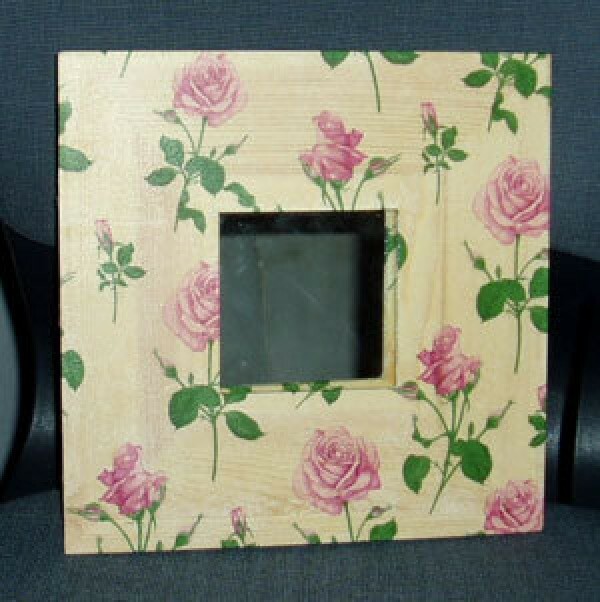 Now, pull your paper up above the frame and apply Mod Podge evenly to the wood face. I usually dilute the Mod Podge a little which helps lessen the chances of tearing the paper when you roll the brayer over it. Then carefully place your paper onto the glue. I find that the easiest way to get the paper onto the glue is to lightly run my finger down the center of the paper and then gently pat the paper down starting from the center and working out. Once that is done, I roll the air pockets out with my rubber brayer. Be careful here because if you have used too much glue and the paper is too wet, the brayer may pull or even rip the paper at this stage. Work slowly and gently once the paper is on the glue. Once you have rolled out all the air pockets, I find it helpful to dry the frame with my portable blow dryer. The faster the glue dries, the faster the paper shrinks back to its original size and the air pockets magically disappear. Once the paper has partially dried, it is safe to gently pat any remaining air with your finger tips or the side of your palm. Allow the frame to dry completely. Once dried, paint another coat of Mod Podge over the paper to seal. Next, glue the paper to the sides of the frame. You can cut each corner of the paper before you glue or after. Once dried, trim the excess from each corner. Now, the area where your mirror will go must be cut and trimmed. I find it easiest to use small scissors and cut an 'X' across the paper and then simply glue down to the inside of the frame. Now seal the outer edges and inner edges with Mod Podge. Finally, paint on the water based sealer to all papered surfaces. I usually do several coats with dry time in between. The wooden framed mirrors from IKEA come with the hardware to hang so simply attach the hanger to the back and your project is finished. Although all kinds of paper can be used, the thinner the better as it will give the impression that the design is painted onto the wood. Fabric can also be used, but again the thinner the better. The advantage to using fabric is that if you don't position it correctly the first time, simply pull it off and reposition. 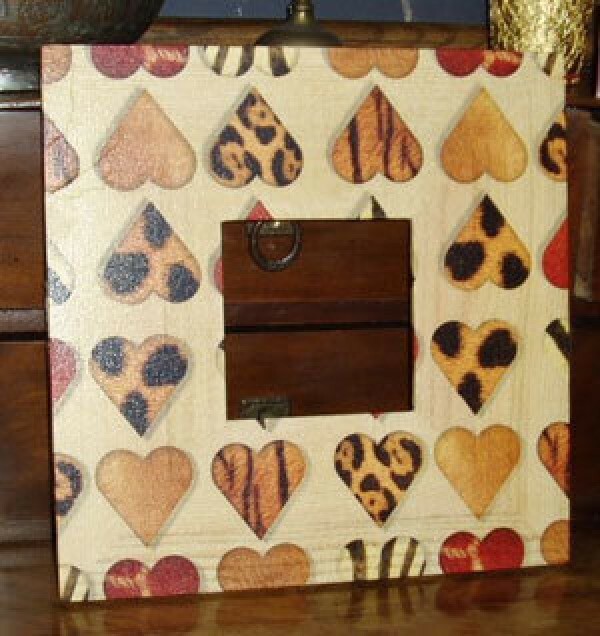 Once you master this, you might want to try cutting designs out and applying them onto the frames. This is fun and gives you more opportunity for creativity. 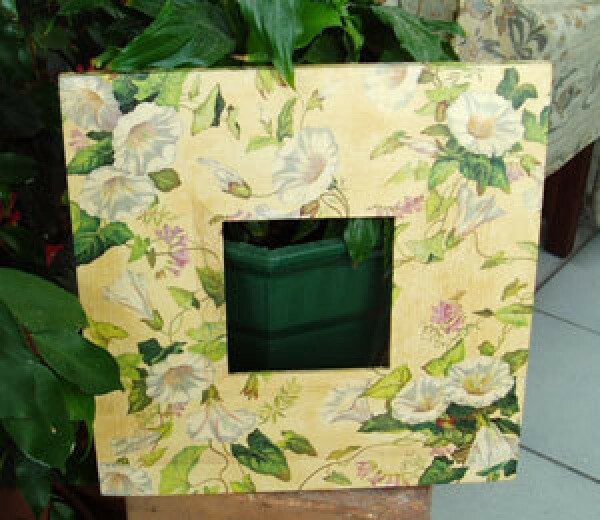 Remember that decoupage can be used on many surfaces so let your imagination run wild! 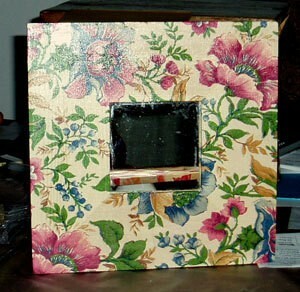 You do such beautiful and creative decoupage work - do you just give it as gifts or do you sell it? It is very simple and elegant. Thanks for sharing such beautiful and wonderfully simple ideas! These are beautiful and look so elegant and expensive. Could you post the directions? Thanks a million. These are lovely! My favorites are the floral, especially the yellow one you have on top! Exquisite! Thanks for sharing! I love these creations! I would also like to request a posting on how to do them. Thanks so much.